Woodland Manor is a historic country house that dates back to the 1800s. Located in the heart of the Bedfordshire countryside and surrounded by acres of scenic woodland garden, the picture-perfect venue creates a scenic backdrop for any event. From weddings to rural weekends away; and from corporate functions to Christmas parties, our beautiful venue is available year-round for exclusive hire. We specialise in organising tailored events and take great care to understand the individual needs of our guests. We are very proud of the extremely high standard of service that we offer, with our friendly and professional staff providing attentive yet unobtrusive assistance. The secluded setting of Woodland Manor belies its excellent accessibility. We have great links to many major cities, including Cambridge, London and Oxford. 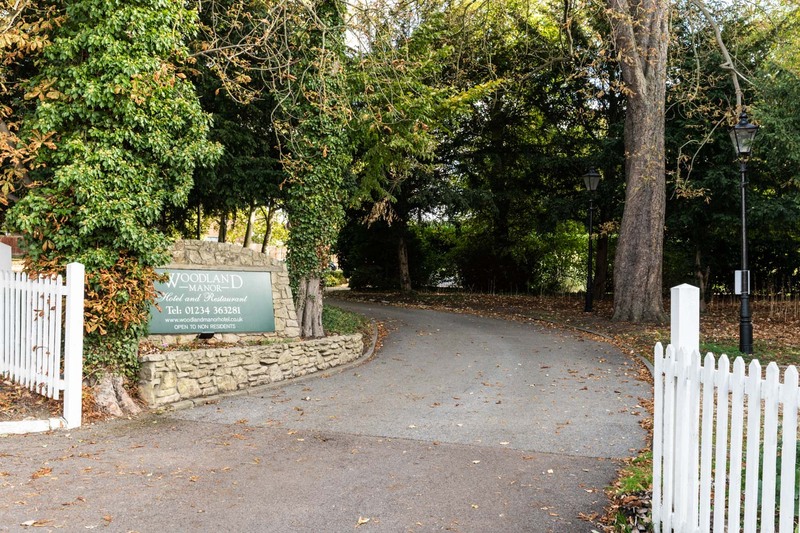 Woodland Manor is located just two miles from Bedford town centre and the well-connected local train station. We are easy to reach via the A1 and M1, and have free parking on-site for some 120 guests. Woodland Manor Hotel is amply equipped with 34 well-appointed bedrooms and suites, each one individually decorated. Replete with comfortable beds, fluffy pillows and soft linens, our rooms ensure a peaceful night’s sleep. When it comes to dining, guests can choose to eat out in our stylish restaurant or relax in the informal setting of our cosy lounge bar. We serve a selection of delectable international and domestic dishes, complemented by an extensive range of wines and beers from across the globe. Served in our beautiful conservatory, afternoon tea is a speciality of ours. Enjoy tiers of plates generously filled with sandwiches, homemade cakes and scones, accompanied by side dishes of strawberry jam and clotted cream. Our wide selection of teas includes Earl Grey, Assam, Darjeeling, breakfast, peppermint and fruit, in addition to a decaffeinated option. To make a special occasion extra special, customers can choose our sparkling afternoon tea option, which features English sparkling wine from award-winning winemaker Chapel Down. Our beautiful country house has 34 well-appointed bedrooms and suites. Each stylishly decorated room features a comfortable bed and soft linens, ensuring a great sleep before and after your corporate event. All rooms include an iron, ironing board and complimentary Wi-Fi. Woodland Manor has a fascinating and eventful history, featuring, among other things, a disgruntled son, a long lost will, and an exhumed reverend. The prestigious venue is today owned by Raj Regmi, who took charge in 2018. Raj has vast industry experience and a huge passion for running hospitality and event venues. He won Peterborough Young Entrepreneur of the Year in 2017 and has previously managed the Serpentine Bar & Kitchen in Hyde Park and the café at the historic Chiswick House. In addition to Woodland Manor, he currently runs Lakeside Kitchen & Bar and Ferry Meadows Café, both located in Ferry Meadows Country Park, Peterborough.